During America’s infancy, the government didn’t want to put President George Washington or any of the Founding Fathers on U.S. currency. Since government-issued coins had first appeared in the world, it was common for the faces of kings, queens and emperors to appear on them. The Founders had just gotten a constitutional republic up and running, and didn’t want the nasty habits of the old monarchies slipping in. Instead, the Mint adorned coins with an image that made a clear statement about the difference between the government the American colonists had rebelled against and the one they hoped to build: a portrait of the female personification of Liberty (and an American Eagle usually on the reverse). It wasn't until 1909, the 133rd birthday of the nation and the 100th anniversary of Abraham Lincoln's birth, that a president’s face would be featured on a coin. President Theodore Roosevelt wanted to reinvigorate the design of American coins with elements of classically influenced sculpture and art. He was particularly taken with a 1907 portrait plaque of Lincoln sculpted by Victor David Brenner. Lincoln’s birthday was well-timed, and the portrait was placed on what was planned to be a commemorative coin produced for only that year. That summer, 22 million new Lincoln cents were minted in Philadelphia and circulated. They were so popular with the public that the mint kept turning them out, even after the Lincoln centennial. Twenty-three years later, George Washington finally got his day. In preparation for the bicentennial of Washington’s birth in 1932, the Treasury Department and the George Washington Bicentennial Commission were toying with the idea of a releasing a commemorative coin and medal featuring Washington’s likeness. They asked the public to submit design ideas. Treasury Secretary Andrew Mellon liked the work of New York sculptor John Flanagan, and his profile of the president was placed on the Washington quarter. 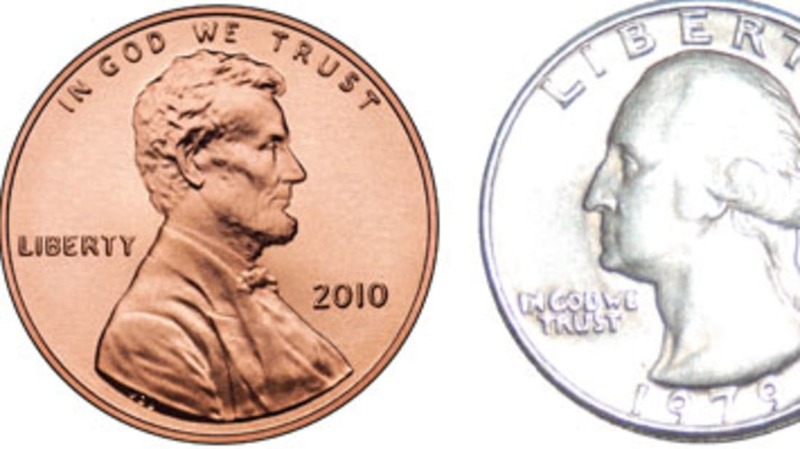 Like the Lincoln penny, the quarter continued to be produced long after its intended run. In 1938, the Treasury Department announced another public competition to solicit designs for a new coin. They wanted a new look for the five-cent coin, featuring a portrait of Thomas Jefferson on one side, and Monticello, Jefferson’s historic Virginia home, on the reverse. Three hundred and ninety designs were submitted, and the Treasury awarded the prize to German-American sculptor Felix Schlag, whose portrait was based on a bust by sculptor Jean-Antoine Houdon. The coin featuring Schlag’s work was released later that year. Shortly after the end of World War II and the death of Franklin Roosevelt, the Treasury received numerous requests to honor the late president by putting his portrait on a coin. Roosevelt’s role in the formation of the March of Dimes made the question of which coin to place him on an easy one. On January 30, 1946, what would have been his 64th birthday, the dime bearing his portrait was released to the public. Following President John F. Kennedy’s assassination in November 1963, the Treasury wasted no time; they honored the fallen president by swapping his image for the one of Benjamin Franklin on the half-dollar. President Lyndon Johnson issued an Executive Order directing the U.S. Mint to make the change. The new coins, bearing a portrait by Gilroy Roberts, began being minted in 1964. In 1971, the Treasury made another presidential addition to circulating coins when they put Dwight Eisenhower on the first new one-dollar coin issued since the Coinage Act of 1965 ordered a five-year moratorium. In 2007, it was announced that the rest of the presidents would get their turn on a coin when the mint began issuing $1 circulating coins—four per year—featuring the images of the presidents in the order that they served in office. Why Is Lincoln Facing the Opposite Direction? As noted above, Teddy Roosevelt chose Victor David Brenner’s portrait of Lincoln for the penny. That portrait is based on a bronze relief portrait plaque of Lincoln that Brenner had previously made. The plaque, in turn, was based on a photograph of Lincoln taken in February 1864 by Anthony Berger. Lincoln faced right in the photo, so he faces right on the plaque and also on the penny. Why Are Only Dead Presidents on Coins? The reason for putting only deceased presidents on circulating coins goes back to the earliest days of the nation, and follows the reasons those leaders had for not putting the president on coinage at all. While some factions in the young American government were especially enamored of George Washington and wanted his picture on money, the president declined when his portrait was requested for placement on the first U.S. Dollar. The precedent Washington set continued as a long, unwritten tradition until it was written into federal law that no living person can appear on U.S. coinage. Presidents must be dead for at least two years before they are eligible for inclusion in the Presidential Dollar series. The prohibition on living persons only applies to circulating coins, though. Several people have had their images featured on U.S. commemorative coins during their lifetime. The list includes Alabama governor T.E. Kilby, who became the first living person to appear on a coin in 1921, when a commemorative half-dollar released for the Alabama Centennial. President Calvin Coolidge became the first and only president to appear on a coin struck during his lifetime in 1926, when he appeared on the Sesquicentennial of American Independence half-dollar. Senators Carter Glass and Joseph Robinson appeared, respectively, on the Lynchburg, Virginia, Sesquicentennial coin and the Robinson-Arkansas Centennial coin, both released in 1936. (Glass, who had served as Woodrow Wilson's Treasury Secretary, believed no living individual should appear even on non-circulating U.S. currency, and protested his appearance right up until his coin was released). The female personification of Liberty was featured prominently on coins until presidential portraits began appearing in the 20th century. But women appear on modern circulating coins, too: the Sacagawea dollar coin has been minted since 2000, the Susan B. Anthony dollar coin was minted from 1979 to 1981 and again in 1999, and Helen Keller appeared on the Alabama state quarter minted in 2003. Queen Isabella of Spain, Eunice Kennedy Shriver (in her lifetime), and Virginia Dare (the first child born in the Americas to English parents) have also been featured on commemorative coins.